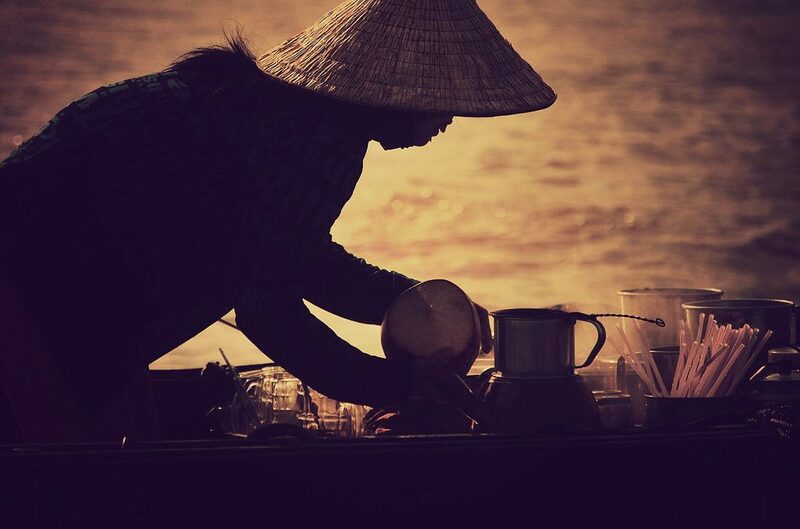 Coffee is LIFE in Vietnamese culture which is why it’s no wonder that Cà phê sữa đá is the one drink that 90 million people can’t live without. The entire city buzzes with happily caffeinated folks from dust until well after dawn. You need only to step into the streets to find young, old and everyone in between sitting at outdoor cafes set up for the day on their small colorful plastic chairs, sipping on Cà phê sữa đá chatting and people watching along the bustling and dusty streets accompanied by the soundtrack of speeding and honking scooters whizzing by. To travel there and see for your own eyes makes it easy to understand how their passion has helped to make them the second largest exporter of coffee, after Brazil. That being said there are literally thousands of cafe’s in Saigon and without a doubt the most popular drink ordered is the traditional Cà phê sữa đá or Vietnamese Iced Coffee. At its simplest, this deliciously caffeinated drink is made with coarsely ground Vietnamese coffee individually brewed with a small metal Vietnamese filter called a phin cà phê. The coffee then takes it time slowly releasing drops of hot coffee into a cup filled up with about 2-3 tablespoons (more if you like your coffee on the sweeter side) of creamy thick sweetened condensed milk. Dark roasted, whole bean Vietnamese coffee works best. Whole beans should be coarsely ground and then immediately used to make your Vietnamese coffee. This provides the freshest cup. In general, it is difficult to find a Vietnamese whole bean coffee but there are a few brands available. Once the brewing is done, which you’ll know either by noticing the drips of coffee have stopped or by lifting the metal lid off the filter and seeing that all the water has passed through, all that’s left to do is stir and pour that yummy goodness over ice and enjoy! For those coffee lovers out there who just happen to be totally intrigued and ready to try a cà phê sữa đá right now let us remind you that there’s no need to immediately open a new tab and book a ticket to Vietnam. All you need to do is hit up your local Vietnamese restaurant as I’m pretty sure they’ll be serving them up. For those who don’t have that option no worries because you know ChestBrew has your cà phê sữa đá craving back. Watch our how-to video before you head on over to Amazon and grab yourself a bag or 2 of our Moon Bear Signature Roast, which makes an outstanding Vietnamese Iced Coffee. While you’re there go here to order your very own cà phê phin (metal filter) and get set with condensed milk and ice in hand to savor the delicious taste of the most popular coffee in Vietnam. After all, can you really doubt the opinion of nearly 90 million people? Have you ever tried Vietnamese iced coffee?